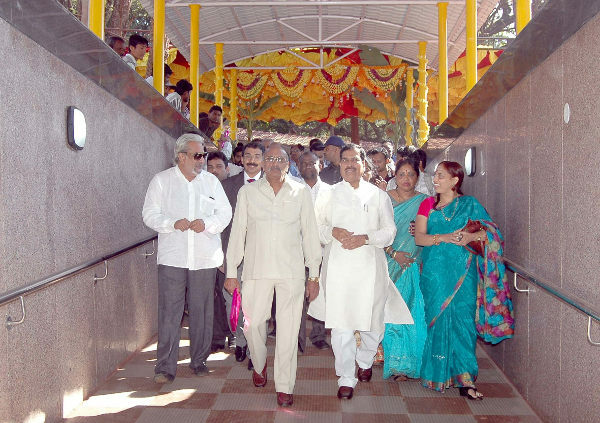 The Pedestrian underpass at the court premises was officially inaugurated today. The work which began on March 18, 2013 is being completed before time of 9 months. The contract was awarded to G.Mastaniah, a Class-I contractor and the project has been completed in nine months. The length of underpass is 24 mts and the size of the vent 5.10mtsx2.90 mts. It has a staircase ramp approach on both sides and fitted with electrification/lighting, drain and sump tank for draining rain water, stainless steel hand rails, roofing with corrugated Fibre Re-inforced Plastic sheets over stairs and ramps, collapsible doors on either sides, ceramic tiles for the floor and Shiva gold granite tile for wall cladding. WHO WERE THE CONSULTANTS ? Well now that it is inaugurated got to see how much will the people at large actually use it.